Pitch a tent on a National Seashore, camp within earshot of the wild animals at the North Carolina Zoo or up the fancy factor with glamping in the mountains. It’s hard to beat the sound of the surf soothing you to sleep at a seaside campsite, unless of course waking to the sound of a babbling brook as the sun climbs over the Smokies is more your speed. 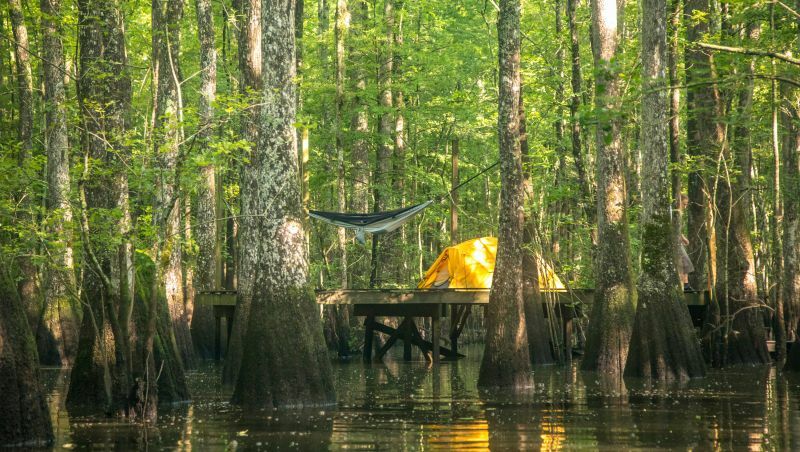 Whether you prefer to pitch a tent in the mountains or by the sea, paddle to your campsite or drive there, rough it or be pampered in a glamping experience you won’t soon forget, North Carolina has the campsite for you. Just east of Cashiers, Panthertown Valley might have a fearsome name, but rest easy, it’s about as peaceful a place as you’ll find. This 6,295-acre wilderness recreation area in the Nantahala National Forest has more than 30 miles of trails, waterfalls galore and all the solitude you could want. It also offers hikers, backpackers and equestrian enthusiasts plenty of fresh mountain air and primitive camping. More information is available through Friends of Panthertown. Imagine waking to the sound of elephants trumpeting as the sun comes up. You might think you need to be on safari in Africa to make this happen, but you can wake to an elephant alarm clock in Asheboro. Trails End Family Campground backs up to the North Carolina Zoo, so all those wild animal calls – lions roaring, elephants sounding out, monkeys chattering to one another – are par for the course. With more than 100 campsites – including 55 with full RV hookups – available, it’s easy to find a spot to set up camp, and when you’re ready, the zoo is right around the corner. Paddle the third oldest river in the world on the French Broad Paddle Trail and camp in a different riverside spot every night. Along a 140-mile section of the French Broad River beginning in Rosman, there are campsites every 15 miles on islands in the river and along the banks, making for days of spectacular paddling and nights of well-earned rest spent in bucolic bliss. From Rosman’s Headwater Outfitters, head north with the current and you’ll meander 34 miles through Transylvania County’s farm fields and pastureland before you reach Henderson County, and later, Asheville (where you can head to one of the breweries for a well-earned beer). What would you do if you had 75 miles of beach to yourself? At Cape Lookout National Seashore, you can find out. Rustic cabins at Great Island and Long Point make the perfect home base for fishing, shelling and exploring the National Seashore, and they include hot water, private bathrooms, bunk beds, a stove and a grill. At Long Point, there’s even electricity and air conditioning in a few cabins. 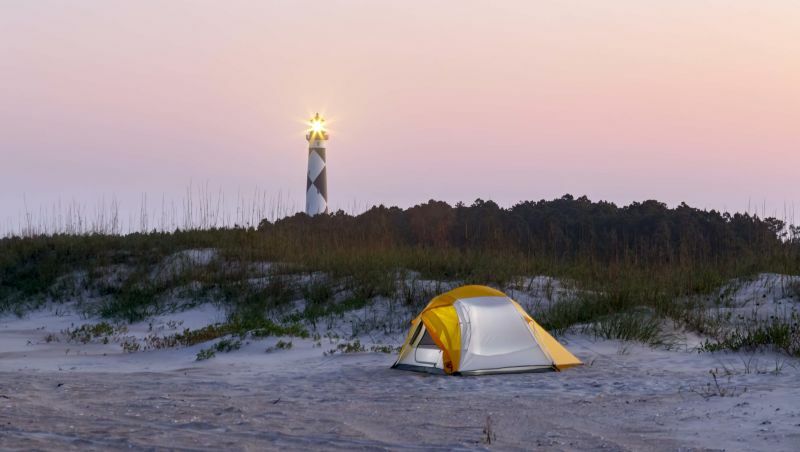 But if your idea of roughing it has a little more “rough” to it, you can also take your tent out on the National Seashore, setting up within shouting distance of Cape Lookout Lighthouse and camping among the dunes and grasses on the island. Long Cove Family Resort offers camping of a different flavor on the banks of Lake Wylie on our southern border. Three dozen tiny cabins, each with designer touches and an unexpectedly elegant look and feel, give couples and families the chance to camp in style. With amenities such as Wi-Fi, Starbucks coffee, TVs outfitted with streaming services and a private beach area, you’d better make your reservations fast. Just 10 minutes outside of Boone, Blue Bear Mountain Camp offers up the typical tent and RV campsites and even ups the ante with solar-powered cabins. But the most unusual – and most luxurious – place to stay at Blue Bear is in its tepee. That’s right, a hand-painted, 22-foot-tall tepee gives you another way to experience nature at its finest. The tepee, like the cabins, is solar-powered and eco-friendly. Best of all, the arrangement of the tent sites, cabins and tepee here offers ample privacy. Indulge your inner child and stay for a few nights in a treehouse overlooking a working vineyard. 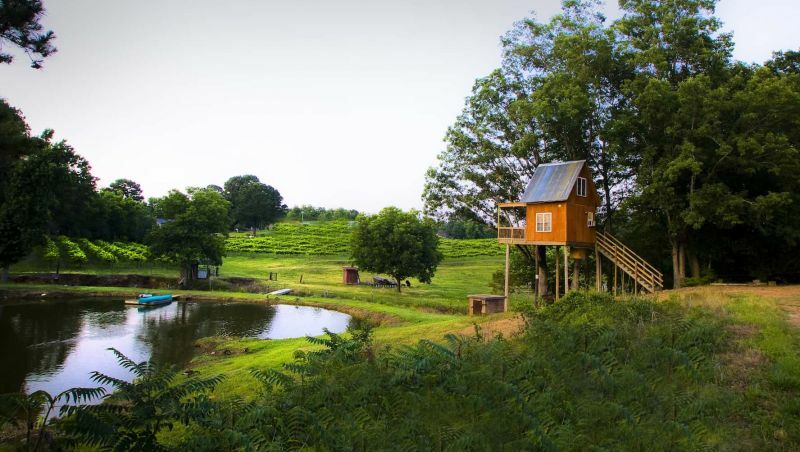 In Monroe, the aptly named Treehouse Vineyards has a pair of treehouses for overnight guests and one more for vineyard events. These are no slipshod, dad-built-a-treehouse-last-weekend treehouses – these are substantial homes perched in and surrounded by trees. Spending the night there is about comfort and relaxation. And wine. You are at a winery after all, so enjoying a glass or two on the huge deck and watching night fall on the vineyard seems the perfect way to end the day. There are 30 boat-in campsites at Lake James State Park, just a few minutes from Morganton. Spend the morning hiking or mountain biking the park’s trails, then load up your kayak or canoe and head over to the camping areas on the Long Arm Peninsula. The campsites, arranged in three 10-site clusters, sit overlooking Lake James from hidden coves, making for a fabulous sunset. In the early morning, a quiet paddle around the lake will bring you close to shorebirds before you paddle back in to make a stack of pancakes over your campfire. Family campouts hold a special place in the hearts of many, and in New Bern, you can set up your campsite at Tryon Palace, the first permanent capitol of North Carolina. In late September, Tryon Palace welcomes campers to pitch a tent on the south lawn for an evening of history, games, campfire sing-alongs, s’mores (what campout is complete without s’mores?) and moonlit walks through the garden. 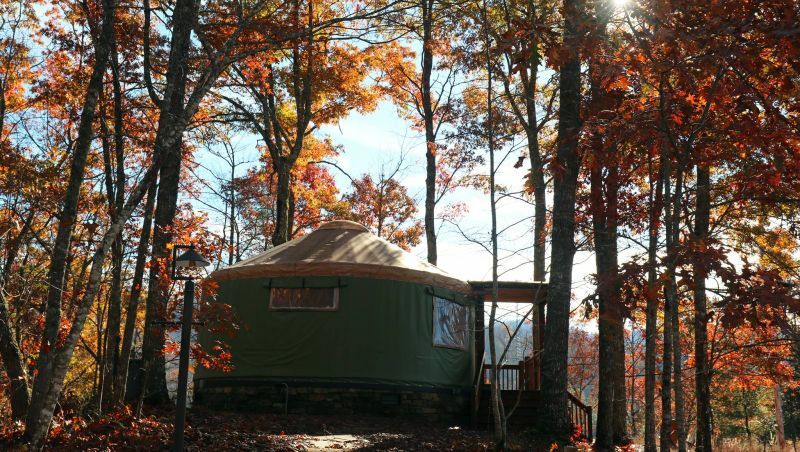 Not far from Bryson City and the Nantahala Outdoor Center, Sky Ridge Yurts adds a bit of glamor to camping with its exotic and well-appointed yurts. Yurts are traditional Mongolian tents, but that doesn’t do them justice; what they are is amazing. These circular houses come in three sizes and have private bathrooms, kitchenettes or full kitchens, and slate-lined walk-in showers. Add to that their Smoky Mountain setting, firepits and all the whitewater rafting, hiking and outdoor adventures at your fingertips thanks to Nantahala Outdoor Center and Great Smoky Mountains National Park, and you have a not-to-be-missed glamping experience. At Asheville Glamping, there’s everything from tree houses to tents and cabins to vintage trailers and domes. And they’re all glamorous. Like, ready-to-be-your-most-popular-Instagram-post-for-the-year glamorous. Beautiful and outdoorsy, the tents, domes, tree houses and trailers here are built for comfort. Air conditioning, running water, electricity and even hot tubs make for a luxe stay that will convince just about anyone that camping is indeed their thing, as long as it’s done right. And here, they do it right. Pack up your gear into your kayak or canoe and take your pick of about 15 riverside camping platforms linked by 140 miles of water on the Roanoke River. 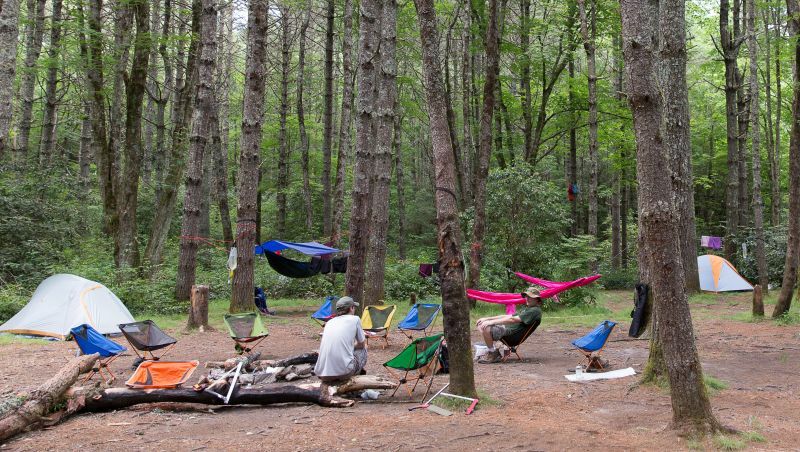 Each campsite offers a unique vibe with differing amenities including screened-in platforms, group platform options, fire pits and privys – but all boast beautiful views that’ll make you one with nature.